Leverage the windows operating system to unlock your server’s true potential. Get the experience of Windows on your virtual private server! 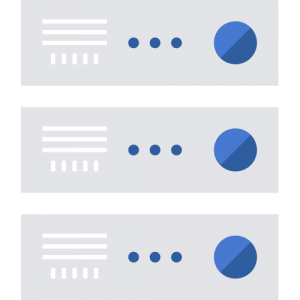 Since our system designed to isolate resources your dedicated Windows Hosting server will provide you with an incredibly fast, secure, and endlessly customize-able tool for managing for your data. Virtual Private Servers are provisioned within 24h or less. Average provisioning time is 4h. You have full admin access to your virtual server, and the ability to reboot remotely from web panel. You can access to your VPS remotely over RDP client from any location at the Globe. Virtual Private Servers allows you to quickly scale vertically with no need to reboot. Our WS Packages can follow your business needs. Upgrade/Downgrade between packages is possible at anytime. Our Windows VPS servers run on XEN Virtualization technology which gives our Windows VPS servers a strong isolated environment. All VPS hosting servers run Windows 7 / 8.1 / 10 Server 2008 / 2012 or 2016 R2 which delivers more advanced capabilities to your business. Our VPS plans are powerful and redundant, and ready to fullfill your business needs! We provide you with a complete machine â including full usability over your hardware. It is based in our data centre for your security, but you have exclusive use of it and never need to share it or any of the available resources (in the form of RAM, CPU, web space and much more) with other users. Go ahead: with root access, full administrator privileges and your own static IP address, you can use your dedicated server to do exactly what you want according to your individual requirements. In short, lease a server from SILENTEXPLOITS and enjoy full freedom for your projects. Your dedicated server should be perfectly tailored to suit you and your project. This is why you have a choice between SATA and SSD storage media. Getting to the heart of the matter, the question is this: reliable and mechanical, or ultra-fast and fully electronic? The more innovative SSD technology, without any mechanical components, provides considerable added performance while costing just a few cents extra. However, the small premium is often more than worth it. If the highest possible lOPS performance is important to you, then a dedicated server with an SSD hard drive will definitely put you ahead of the game. On the other hand, if you are looking for a database server where storage is the main consideration, you will be happier with a SATA hard drive. A dedicated server from SilentExploits offers performance, reliability and the latest server hardware. Servers are setup same-day with selected servers setup in under 24 hours. Most servers come with a 100% network uptime guarantee.